MOSCOW, Russia -- Russia’s day of protests is underway, with hundreds attending nationwide rallies and dozens of arrests already reported. Happy birthday: nationwide demonstrations, including this one in Vladivostok, greeted Vladimir Putin. 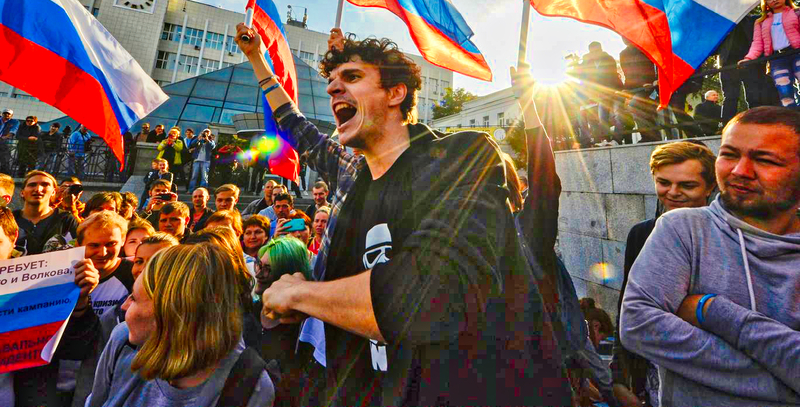 The protests are an unwanted birthday present for Vladimir Putin – who celebrates his 65th today – from leading critic Alexei Navalny. Mr Navalny is himself watching at distance from a Moscow detention cell after being jailed together with his campaign chief last Monday. The protests were originally only planned for Putin’s home town, St Petersburg, but were extended after the sentences. 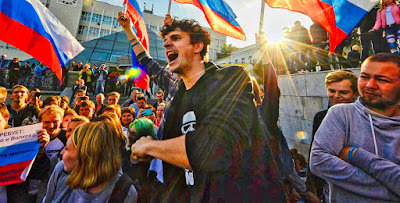 Police told Interfax news agency an estimated 700 people were present at the protest in Moscow. A heavy police presence was visible in the capital, along with members of the supposedly voluntary druzhina pro-Kremlin brigades. A total of 80 arrests were reported during demonstrations in other regions across the country, including 18 in Yekaterinburg, 12 in Tula and 10 in Samara. Putin will apparently be spending his birthday at his desk. There are no plans for a celebration, his spokesman said. Instead, Putin expects a few phone calls from foreign leaders (Donald Trump isn’t one of them) and a meeting with members of his Security Council. How to deal with protests taking place in 80 cities across 11 time zones. While protests in Russia’s far east have already passed without much incident, or indeed attendance, the real drama is expected late in the day in the major European cities. The vast majority of Mr Navalny’s rallies have not been sanctioned by authorities. State and loyal media were curiously silent on today’s protests. Semi-state news aggregator Yandex led its Moscow section with changes in bus timetables. The tech giant has previously been criticised for blanking coverage of opposition rallies. In the build up to the protests, authorities warned of a robust response. Last Wednesday, state media news agency TASS reported a law enforcement source who claimed police had been given instructions to “respond harshly” at the St Petersburg protests. Independent media outlet Fontanka.ru also reported that police had booked 20 buses, with a capacity of 800, to arrive near the protest site; the assumption being that they would be used for arrests. While the authorities have been known to surprise – going soft when least expected, and vice versa – Mr Navalny’s most recent protest actions were accompanied by mass arrests. On 26 March, 1,800 people were detained nationwide, according to OVD-Info, an independent police watchdog that monitors detentions. There were almost the same amount of arrests on 12 June. Both rallies were attended by several tens of thousands. On the eve of the protests, police raided Mr Navalny’s campaign headquarters and detained key regional organisers. To overturn the jail sentences and to allow Mr Navalny to participate in a free election. The Kremlin has shown no signs of entertaining either request. Elections chief Ella Pamfilova has already confirmed that Mr Navalny’s uninvited presidential bid will not be allowed, owing to a criminal conviction that some consider to be politically motivated. How Mr Navalny and his team will respond to a ban as the elections get nearer is anyone’s guess. Today, the Kremlin seemed to give a few clues as to how it intends to play it.